Oregano leaf is a wonderful herb both to use in cooking and therapeutically as needed. 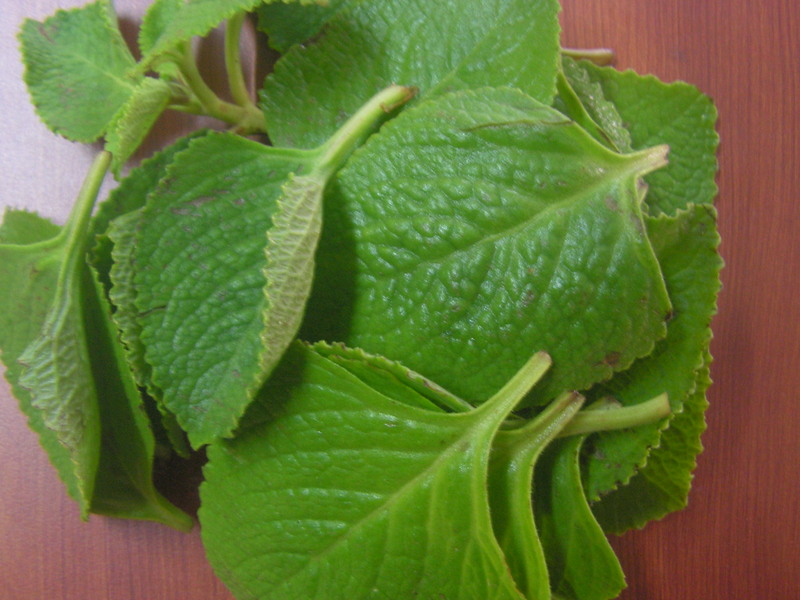 Oregano/Dodpathre/Sambarbalii in English/Kannada/konkani. Oregano is the main ingredient in the Mediterranean cuisines in the U.S and is often used in Pasta sauce. Oregano contains vitamin A C E and K, as well as fiber, foliate, iron, magnesium, vitamin B6, calcium, and potassium. It’s anti oxidant contents support the immune system and its useful in treatment of upper respiratory tract infections. 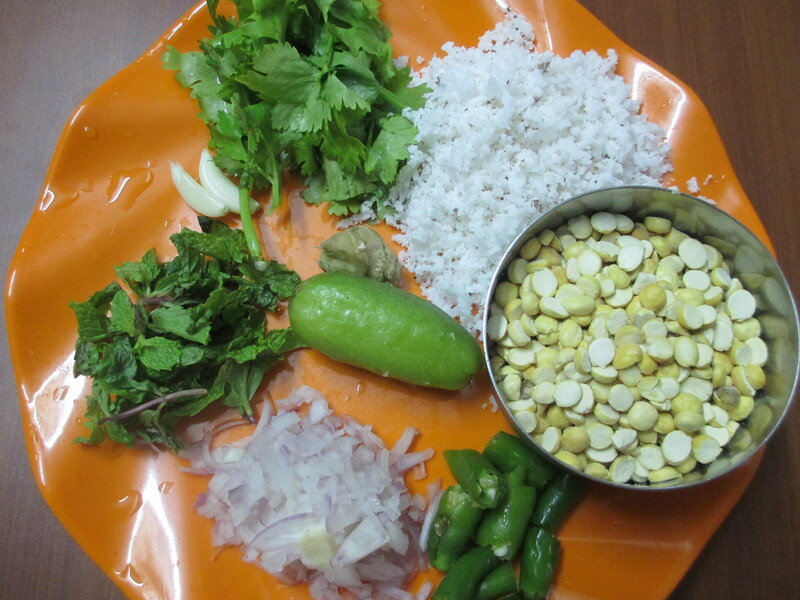 My mom used to prepare this wonderful chutney and i thought of sharing it on this blog today. 1. Wash and pat dry the leaves and chop it fine and keep it aside. 5. 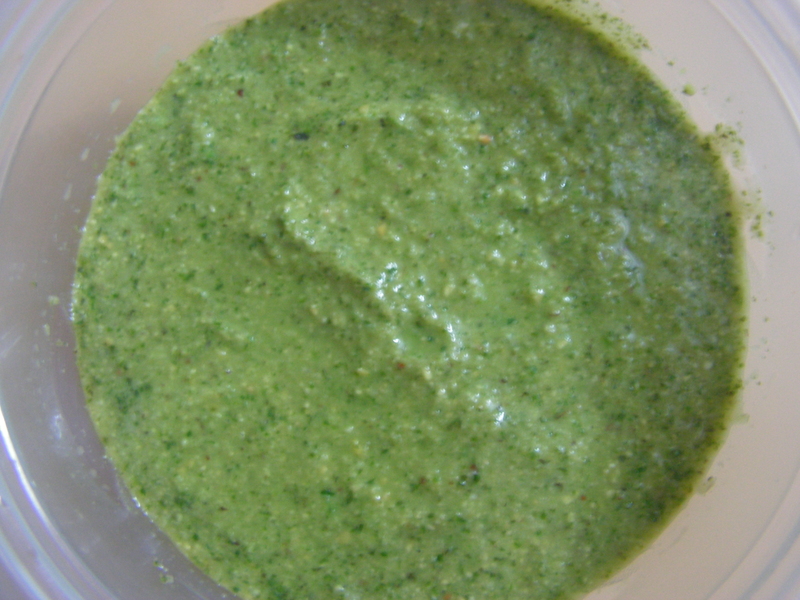 Transfer all the ingredients of chutney in the mixie bowl and adding water in steps grind it to a coarse consistency checking for salt. Place a spatula with a little oil in it. When heated add mustard seed to it. Once it splutters, add cumin seeds to it. Add broken red chili and finally curry leaves to it. Switch off and add it to the ground chutney. 1. Use absolutely fresh leaves. Else it will be tasteless. 2. 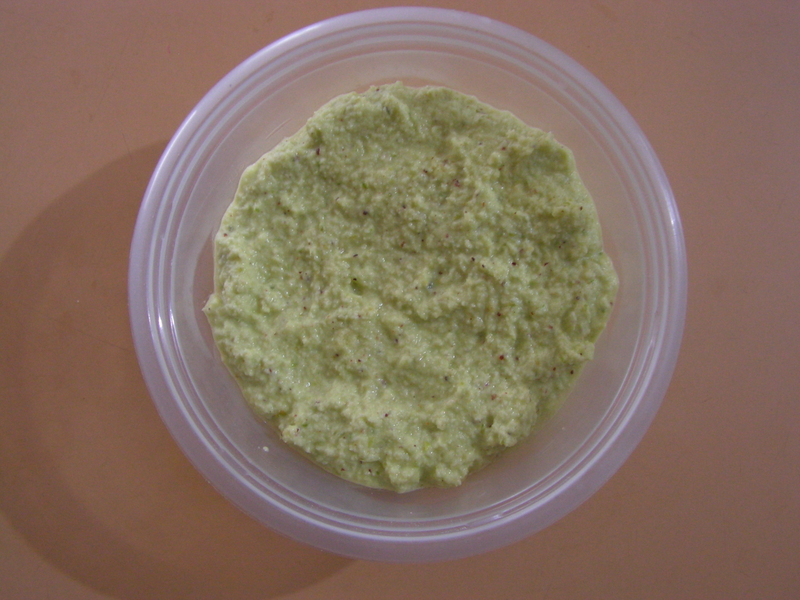 One can even use green chili in place of red chili. 3. No other spice is added for the reason that the aroma and taste of the leaves is lost. 4. One can use jaggery/sugar if needed. This entry was posted in Uncategorized and tagged Oregano leaf recipes, Wet chutney. 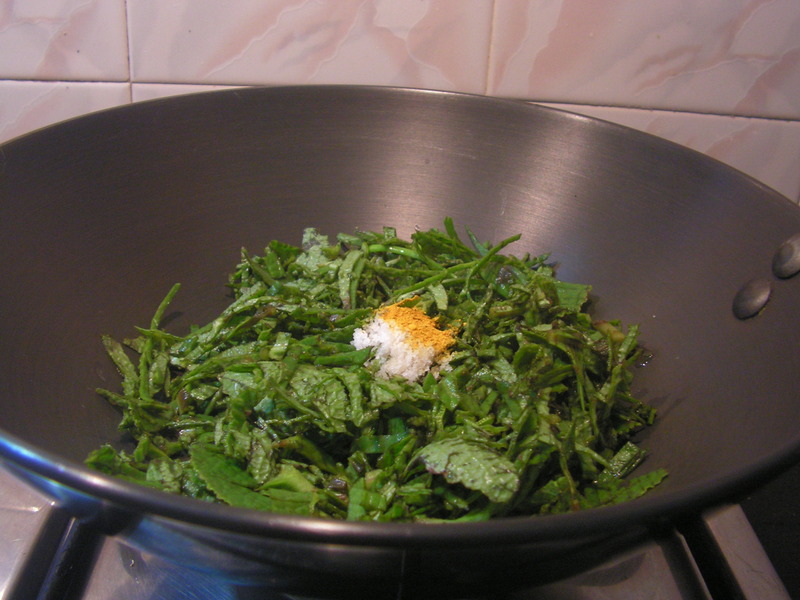 Both peanut and mint are widely used separately in so many of our recipes. I thought why not just put them together and make something and thats how got here. 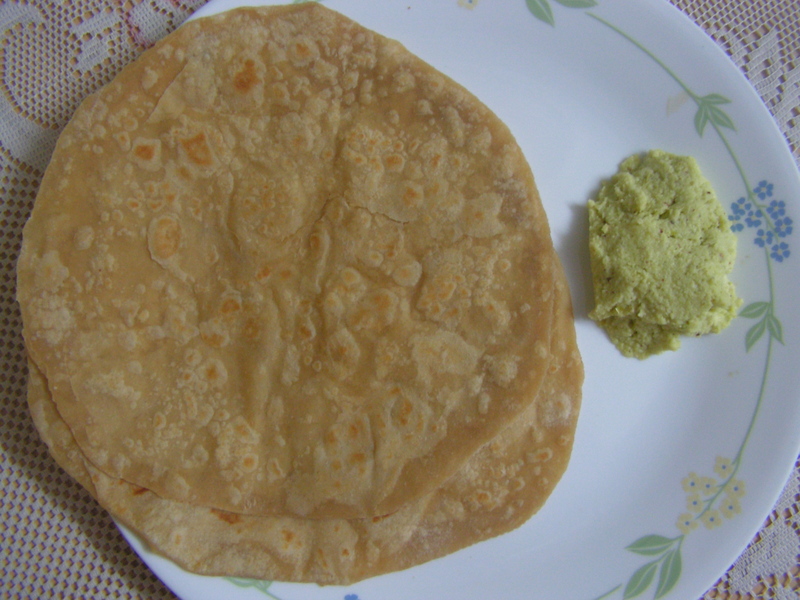 We enjoyed this with roti and I hope you do too. 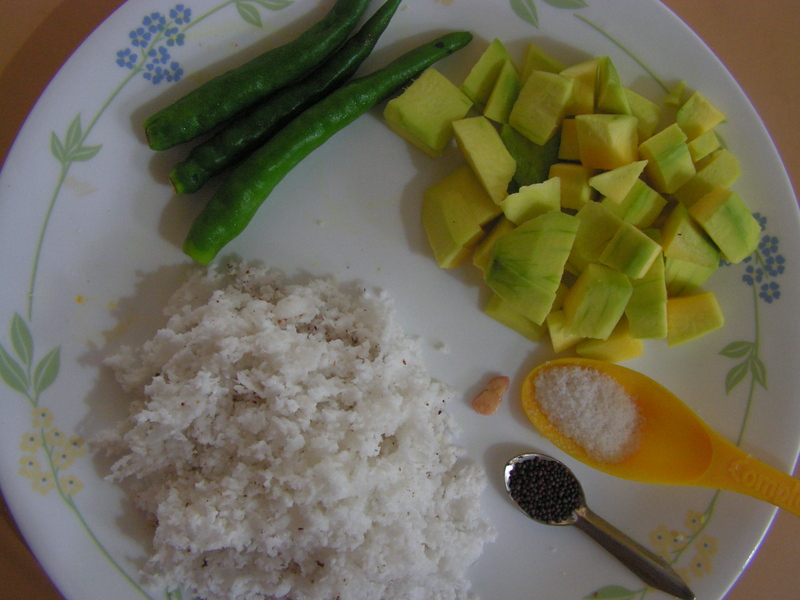 This is not your usual coconut based wet chutney! No coconuts here. 1. Dry roast peanuts till you get a pleasant aroma and peel it on cooling. 2. Place a skillet with 1/2 teaspoon of cooking oil in it. On heating just fry mint eaves too for about 3-4 minutes. 3. Fry slit green chili also in a little oil in a spatula. 4. Place a spatula with 1 teaspoon of cooking oil in it on medium flame. On heating fry chopped onions till transparent. 5. 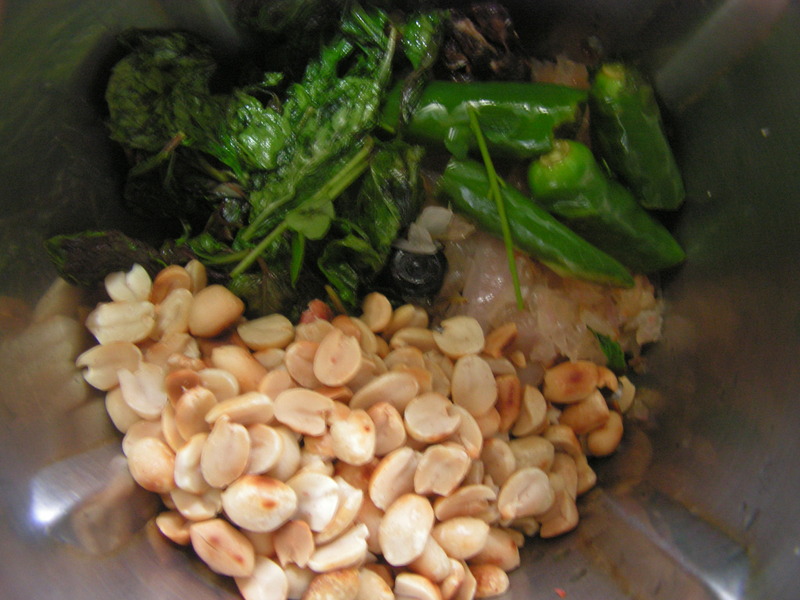 Transfer all the ingredients to mixi bowl and grind it to required consistency adding water in steps. 1. Place a spatula with 1 teaspoon of cooking oil in it on low flame. On heating add mustard seeds to it. 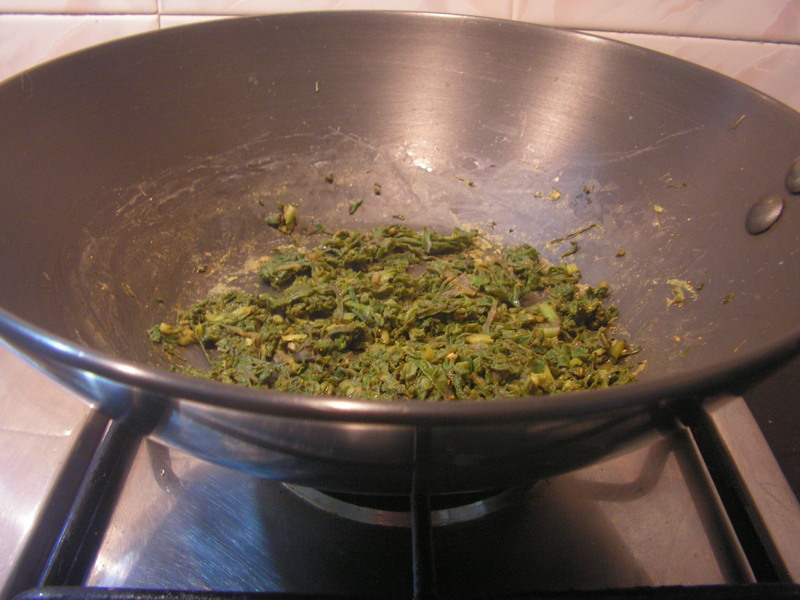 When it splutters add cumin seeds and when it splutters add asafoetida powder and finally curry leaves to it. Season it to the grind chutney. Enjoy with either idli, roti or chapati. 1. 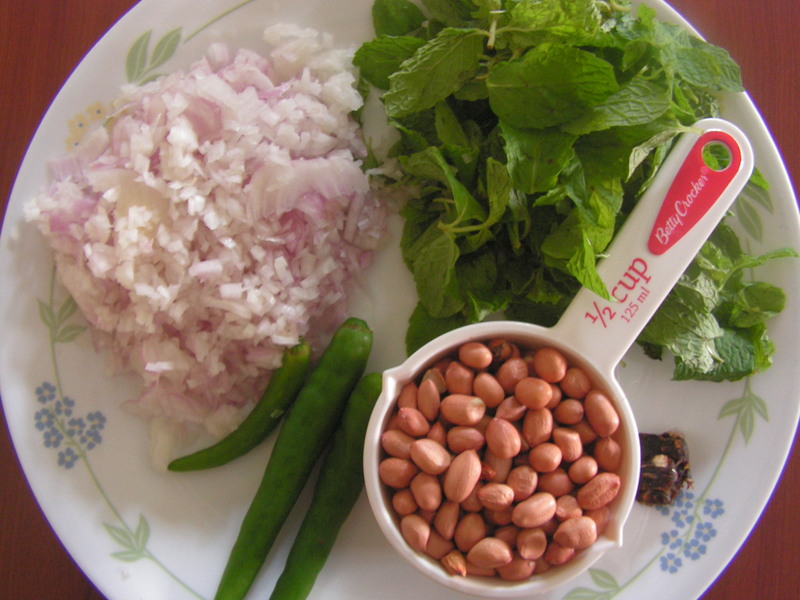 Use fresh mint leaves and also quality peanuts for the dish for best results. 2. 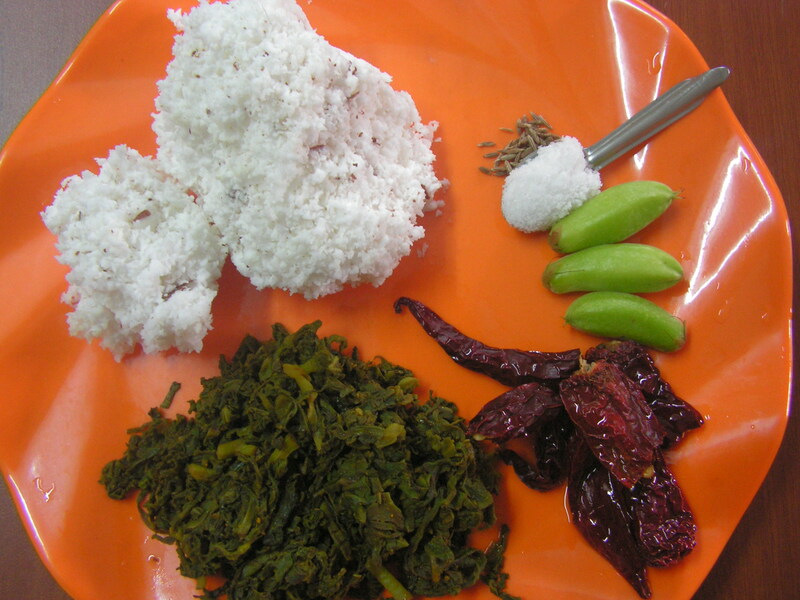 I prefer to use Bilimbi in place of tamarind for sure. It is not at all available in rainy season so no alternative but to use tamarind. This entry was posted in Uncategorized and tagged Wet chutney. 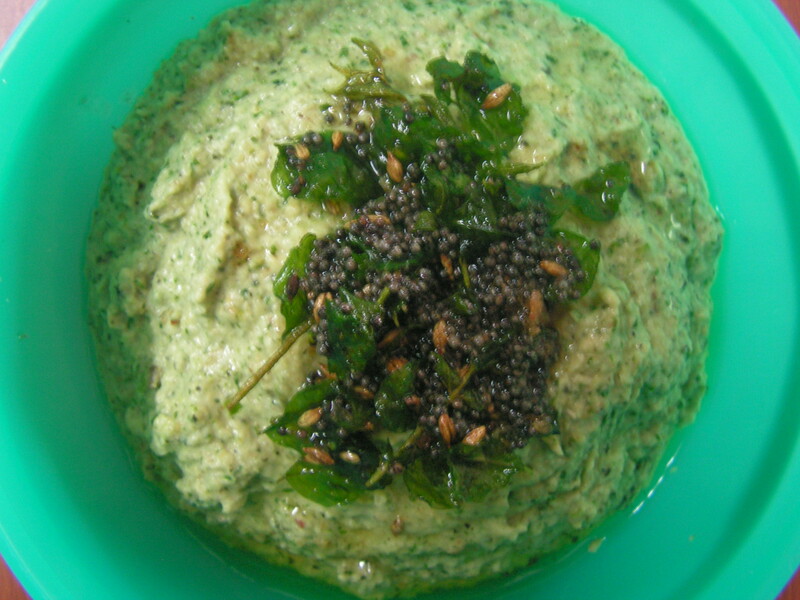 This chutney is really yum to relish with the Madhur Vade. 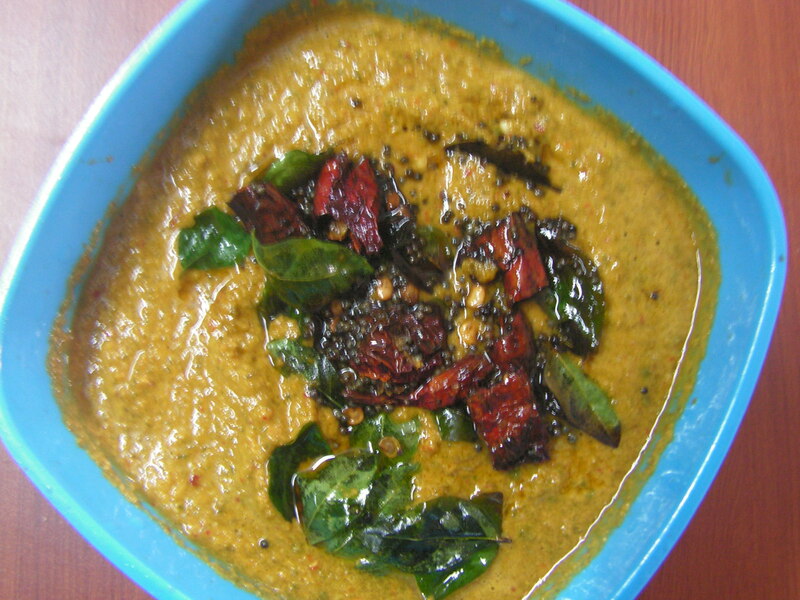 This is a healthier variety since it relies on only a little coconut, with the Dalia dal being the part of the base. 1. Place a spatula on low flame and just warm up Dalia dal for a while. Make sure it is not burnt but till the raw smell disappears. Transfer it to another vessel to cool down. 2. 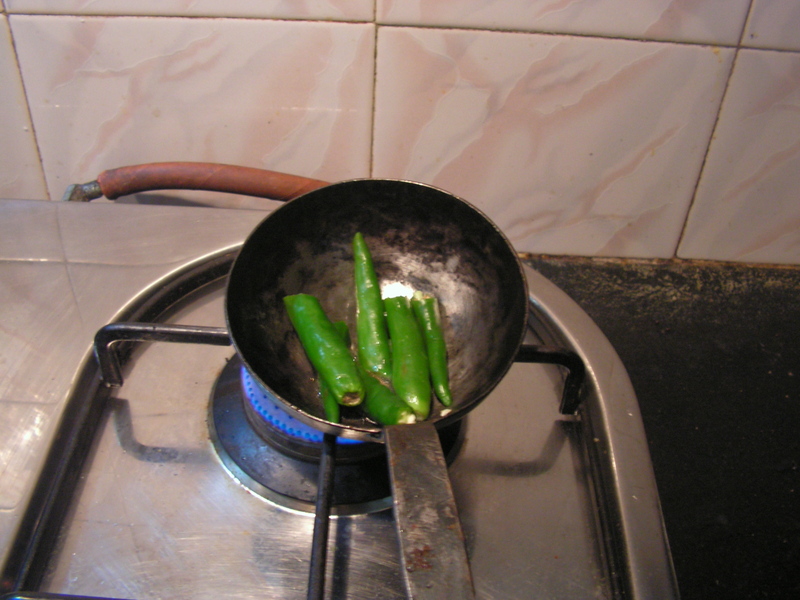 Place the same spatula with a few drops of oil in it on low flame and fry cut green chilli in it till done. 3. Transfer all the ingredients including the roast dalia dal and green chili and salt to a mixy bowl and grind it to a moderate coarse consistency. 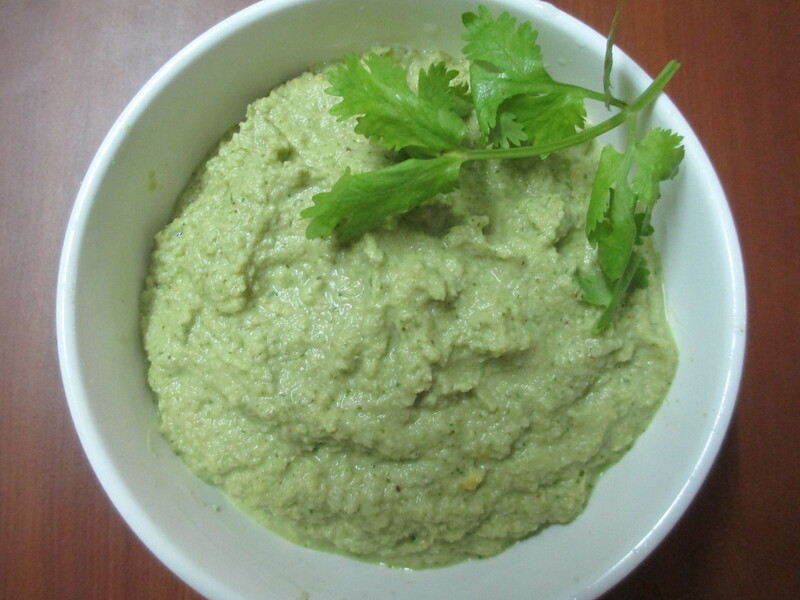 Transfer it to a serving bowl and enjoy with Madhur vade. I am adding this to the long list of wet chutney on this log and that too after a long gap. I have already put up a few dishes with capsicum style peppers like the Aloo Capsicum masala, Capsicum sukhe, Carrot-Capsicum salad, Capsicum roti, Capsicum Cashew curry, Babycorn capsicum masala and these have been popular to varying degrees – in fact Aloo Capsicum Masala is among the most popular posts on the blog. I have used yellow pepper in this post but you can use any of the others – red, orange or the classic green. This chutney is a good combo for Idli, Dosa, Roti and if you were concerned about this yet another coconut dish, well, no. No coconuts here ! 1. Wash and chop capsicum, peal and chop onion, wash and chop cilantro, peal garlic, and keep it aside. 2. Dry roast peanuts till you get a pleasant aroma. Peal it on cooling and keep it in the same plate. 3. Place a skillet with 2 teaspoons of cooking oil in it on medium flame . On heating, add chopped capsicum and fry till soft. 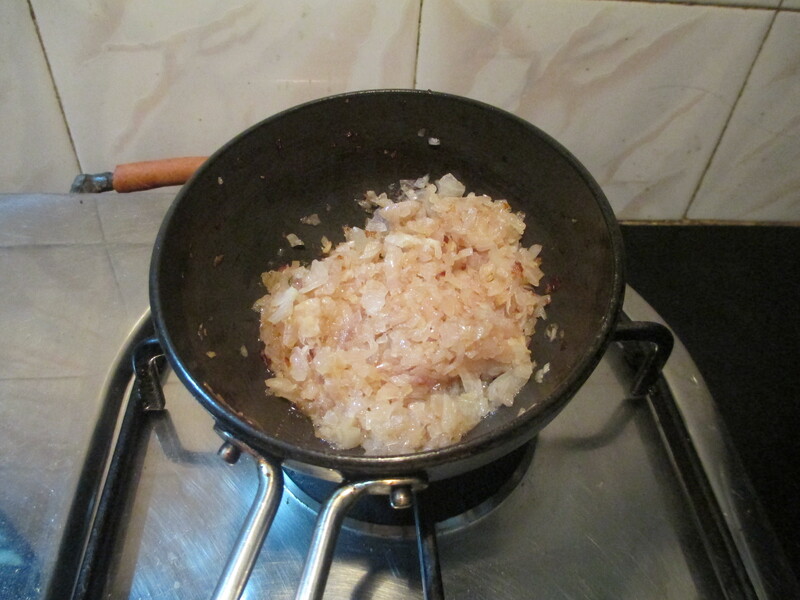 Also add chopped onions and also fry it till soft adding a little salt till done. Add all other ingredients to it. 4. On cooling, grind it in the mixer to a medium fine consistency without adding water. Yum! Go for it with Roti, Dosa etc. ! 1. Capsicum of any color can be used for the dish. 2. One can even change the quantity of onion, garlic as per your taste.